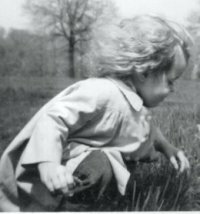 I was two years old and the flower bed on the corner of Belair Road and Chesterfield Avenue was a glorious part of the many days I spent in Herring Run Park. As a little girl, I would often go with my Grandfather, who took the picture above. At the park I would pick flowers, throw rocks in the stream, pick apples, raspberries, collect leaves. It was an amazing place to explore and wonder about life. It even had a fresh spring water spout where we’d lug empty milk containers to fill up with the really cold water. It was amazing to have so much nature surrounding you in the middle of a big city. Now, every time I look at that I photo, I instantly connect to the little girl full of wonder and eager fascination. My idealistic view of life and my willingness to try, try again at difficult tasks stems from my days as a girl in the park. I remember my Grandfather holding buttercups up to my chin so that we could find out if I liked butter – if your chin glowed with a yellow reflection of the flower, that was the positive sign! Simple, simple things. They still matter so much. I look at this photo daily and it centers me. I remember who I was in those days and bring that little girl with me wherever I go. She is me and I am her, both of us bathed in the golden glow of newly picked buttercups. This entry was posted in Music and tagged Baltimore, Childhood, Music. Bookmark the permalink.